Several (actually all) of my recent blog postings have been about old pictures that I have found lying around or in searches for something else and why they are important to me. 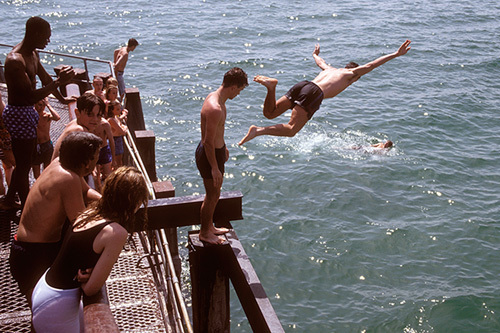 The latest one shows some young guys diving of of Bournemouth Pier in the early 1990s and it was part of a set that I did for a trades union magazine. The commission was as simple as it was vague – to produce images of the seafront at Bournemouth that could be used in a preview of the union’s annual conference that was being held in the town. Commissions in those days always attracted expenses and that invariably included the cost of film and processing. The job was only a half-day but what a beautiful half day it was. The sun shone, the beaches were packed and nobody seemed to mind me wandering over and shooting their picture. The people diving from the pier made some great pictures but the dangerous nature of what they were doing meant that the client didn’t even want to consider them. Shooting slide film in those days carried certain risks, not the least of which was that there was only one original. If that got lost or if the client decided to hold on to it there was nothing that could be done about it. Affordable scanners didn’t really exist and getting duplicate transparencies made was very expensive. These days we can just keep as many copies as we have hard drives and in the days of black and white it was always easy enough to knock out an extra print but there was that scary and even precarious time where you had to get the exposure spot on, hope that the film was processed correctly and that the couriers wouldn’t lose the package containing your work. It is quite amusing to think that “fast turnaround” was measured in hours and the three days or so that it would have taken me to get these images from the camera to the client would have seemed eminently reasonable. I’m really enjoying this trip down memory lane of yours Neil. Keep up the great work.